This Healthy mouth gift set includes one Coconut and Clay Toothpaste with Neem and CoQ10, one quality copper tongue scraper and one pack of Smart Floss dental floss. It is packaged in a gift box with paper confetti filler. 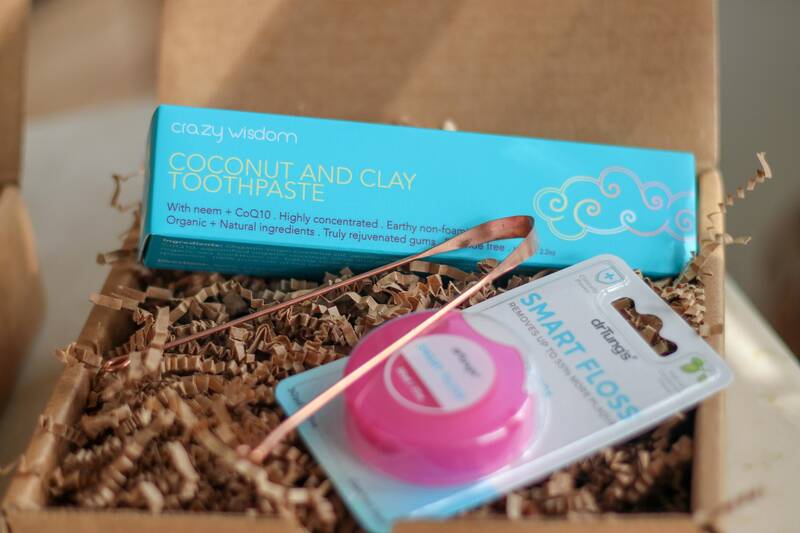 Crazy wisdom coconut and clay toothpaste is carefully formulated for optimal teeth and gum health. The highest quality clays and herbs are used to draw toxins and heavy metals out of the gums. Anti-bacterial and anti-viral ingredients leave the mouth feeling balanced and refreshed. Many users enjoy whiter teeth and healthier looking gums after just several days. *No fluoride or sweeteners. Toothpaste Ingredients- Zeolite Clay, Green Clay, Organic Virgin Coconut Oil, Alkaline Water, CoQ10, Baking Soda, Organic Neem Oil, Saponified Organic Coconut, Olive and Jojoba Oils, Organic Aloe Vera, Rosemary extract, Organic Sea Buckthorn Oil, Organic Cinnamon, 100% Pure Oils of Oregano, Tea Tree, Peppermint, Spearmint, Rose, Thyme, Celtic sea salt and Grapefruit seed extract. *We offer toothpaste tube recycling- please write for more details. A tongue scraper is a simple must-have as part of your daily cleaning routine. Smart Floss dental floss is clinically proven to be more effective than regular floss. It has been shown to remove up to 55% more plaque than some of the most popular flosses. It stretches and expands into interdental spaces to clean better and is suitable for everyone - people with tight spaces, wider spaces...even braces. This floss is gentler on gums because it is soft and can stretch, unlike flosses with no spring that can often hurt gums...and fingers!